A New Driver Behind the Wheel - More Adventure! We're back home after our 10-day trip to DayStar Academy, 900 miles from our California home, located near Moab, Utah. The trip was full of new and interesting events - we always seem to find adventure wherever we go! The purpose of this trip was to attend the annual Mission Projects, Inc. board meetings and of course, to spend some time with our son Daniel, who's studying as a Junior there. Heading east two weeks ago, we played tag with snowstorms over the Sierras, then across the Nevada and Utah deserts & mountains. 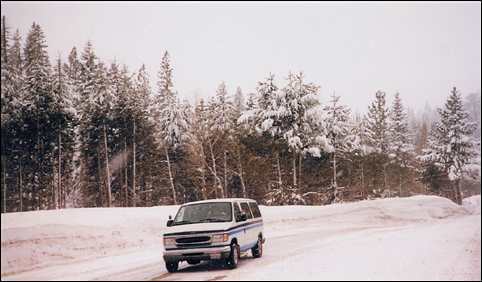 Most of the time temperatures were well below freezing, and the snow was dry & powdery, so the roads weren't too slippery. The desert hills and mountain cliffs look so beautiful highlighted with snow, compared to their dull appearance the rest of the year! We detoured through Capitol Reef National Park, which rarely gets snow. 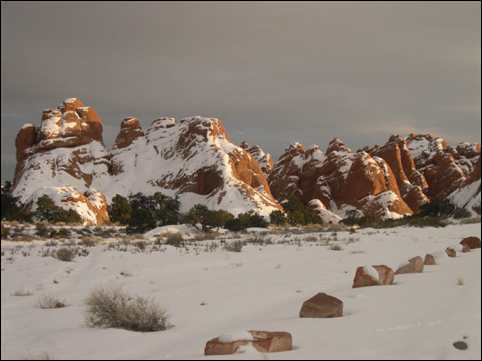 White snow highlights on red rock ledges really add a lot to those majestic cliffs and formations! 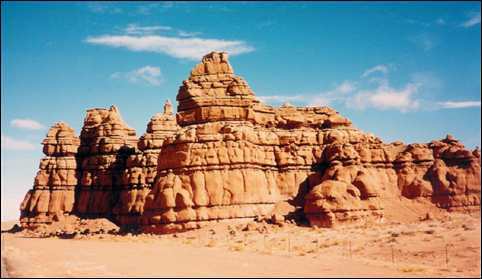 The photo below was taken from the sunny side, which had no snow. Daniel was delighted to see us when we arrived on our third day of travel. He showed us his room, which he shares with two roommates in the basement of the dean's house. His part was quite tidy, but the rest was a mess! We moved into a comfortable guest room - with good heat, thankfully - it was a chilly 16° F outside! 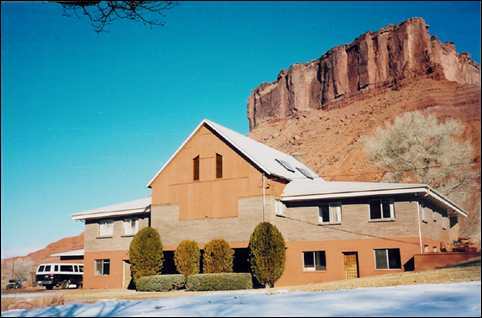 DayStar main campus building with majestic Parriott Mesa looming grandly above. 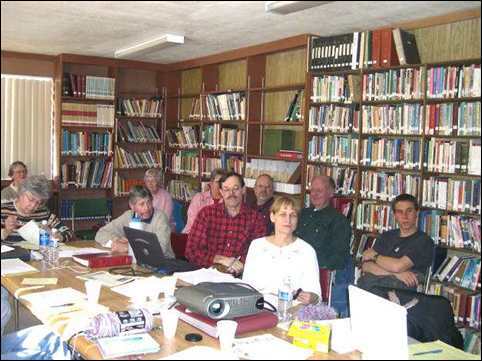 Friday and Sunday we met with about 20 members of Mission Projects, Inc. (MPI) for our Board meeting. Other years Daniel has disliked our "Bored" meetings as he called them, but this time he joined us and really enjoyed hearing the reports and discussion. I showed pictures of our mission trip to Chiapas last year, then about the current activities of our sponsored laymen taking the Gospel to remote, unentered areas throughout Mexico. Now that we look at the picture, it does look like a "bored" meeting! Sabbath afternoon was fun. 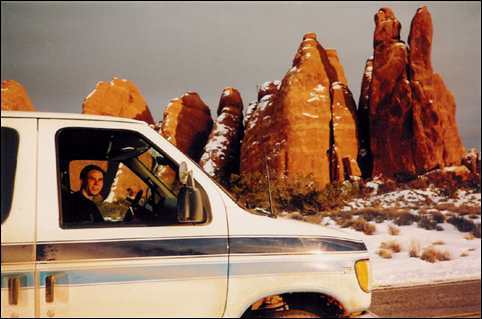 Daniel drove us to Arches National Park, about 30 minutes away. Diana stayed in our guest room to rest, and Harold Beavon, an elderly member of MPI, rode in the passenger seat. We met the rest of the MPI folks by The Windows, driven there by Jerry Harris and Bev Christensen in the DayStar vans. When we first arrived, it was overcast, with sun shining on the snow-covered LaSal mountains off in the distance. We had sunshine at first, then it began snowing from time to time. Daniel and Harold hiked to Delicate Arch viewpoint, then we went to Devils Garden, where snow covered shelves and sides of the red rocks and the ground below. 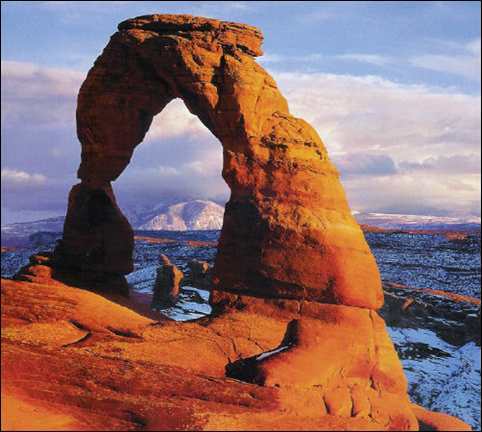 I rode in the back seat and waited about half an hour as Daniel and Harold hiked past several arches to long, thin Landscape arch. It got pretty cold, as temperatures were in the low 20's. The other vans arrived as we were leaving. Just then the sun peeked out from below the clouds as it was setting, casting a brilliant glow on the snow-covered rock formations. As we headed out of the park, the two DayStar vans fell in behind us. Our van just cant help leading caravans, and as we've done for the past 3 years, it was ready to lead the MPI folks behind us clear to Chiapas, Mexico! Daniel pulled over so we could enjoy the rainbow of sunset colors in the sky, and the other vans kept on going. Jerry told us later that when they realized I wasnt driving, they saw no need to follow! We drove down a snowy road to see the sunset better, then headed out of the park. Daniel kept looking at the sky and rock formations, and several times got off the edge of the pavement on the narrow road, but otherwise he did great! It got dark quickly as we headed back to the school. Just before we arrived, Harold asked Daniel how long he had been driving. He was surprised that this was only Daniels third time driving on public roads! Daniel just got his Learner's Permit 5 weeks before. He drove us 100 miles, and he really enjoys the freedom and feeling of power being behind the wheel! 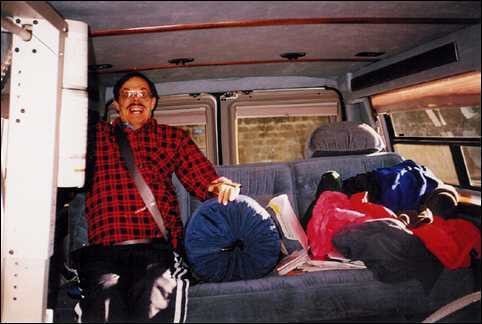 When Daniel first started driving on public roads, I was a terrible back-seat driver! 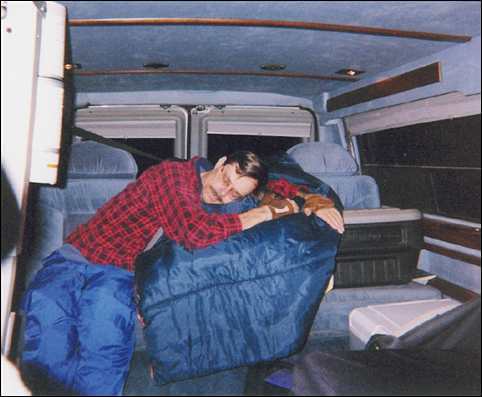 Eventually I relaxed and took a nap as Daniel drove us back to the school campus after dark. Sunday we had meetings again all day. This time Daniel took his mom and his roommate Ricky exploring a dirt road beyond Potash, hiking along a sandstone ridge and shopping in Moab, 30 minutes away from DayStar Academy. Meanwhile, the rest of us finished up our meetings.